6.5-liter V12 + hybrid system = awesome. It's hard to imagine getting any more hyped up for the upcoming Aston Martin Valkyrie hypercar. The Valkyrie has already claimed the world record for the most powerful non-turbocharged production engine with its 6.5-liter V12. On its way to its record-breaking power figure, the V12 engine revs to an ear-shattering, F1-rivaling 11,100 rpm. No other road car will be able to rival the ferocity of this upcoming hypercar, except perhaps the upcoming AMG Project One. What makes the Valkyrie even more impressive is its additional power boost from the integrated hybrid powertrain that was co-developed with Red Bull, Cosworth, Rimac, and Integral Powertrain. We didn't know exactly how much total output the Valkyrie would produce but Aston Martin has now revealed the official figures. Aston says the Valkyrie will produce a maximum output of 1,160 hp at 10,500 rpm and 663 lb-ft of torque at 6,000 rpm. The V12 produces 1,000 hp and 545 lb-ft of torque on its own while the battery-electric system from Rimac adds an additional 160 hp and 206 lb-ft of torque. The battery pack can drive all of the car's various sub-systems and provide power boost and energy recovery. Like a Formula 1 car, the Valkyrie will gather energy from braking using a KERS-style boost system and store it for later use. 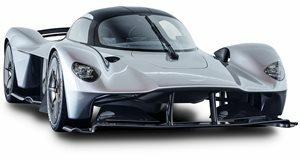 Aston hasn't announced any performance metrics such as 0-60 but we expect the Valkyrie to be blisteringly quick. "Aston Martin Valkyrie is set to be the ultimate hypercar in the automotive world and these performance figures underline that statement. Red Bull Advanced Technologies, Cosworth, Rimac and Integral Powertrain Ltd. have been fantastic partners in the development of this powertrain, ensuring that we have already created a hybrid system that is emissions-compliant and ready to begin fitting to our first physical prototypes. I am, as I’m sure the rest of the world is, incredibly excited to see and hear the first of these cars on track," said Aston Martin Vice President and Special Vehicle Operations Officer, David King.